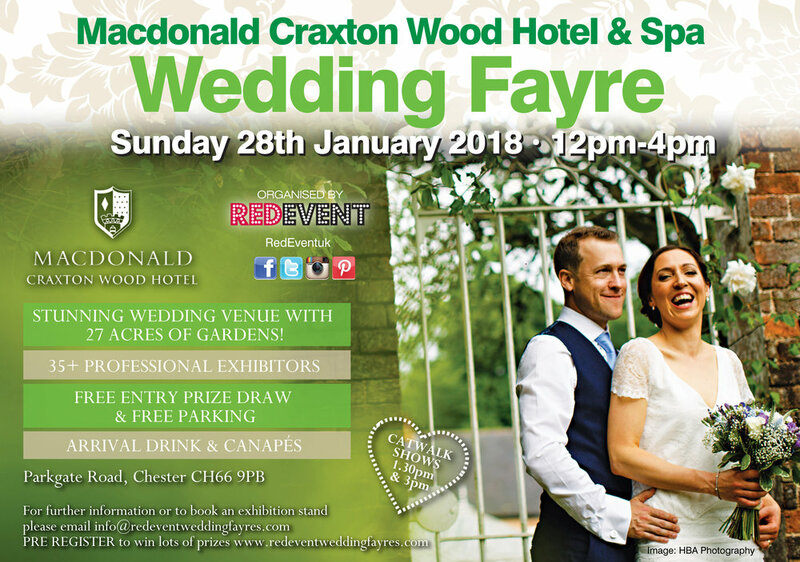 Come along to our popular Cheshire Wedding Fayre at the Macdonald Craxton Hotel & Spa to view the stunning wedding facilities and spa, chat with the Hotel's Wedding Team! Book your wedding on the day of our wedding fayre and receive a £200 bar tab or delicious canapés for your wedding guests (max of 50), only on Sunday 16th September, 12-4pm. The MacDonald Craxton Wood Hotel & Spa blends the best of British tradition with 21st century comfort and style. A beautiful secluded hotel, it is a picture perfect wedding venue combined with outstanding comfort and accessibility as well as award winning food and drink! They have a huge stunning wedding Suite bathed in Natural light and a spa that recently went through a 1.2 million pound transformation perfect for easing your wedding stresses away! The Macdonald Craxton Wood Hotel & Spa are also giving away a FREE Spa Day for you and your finance in our free raffle prize! The winners will receive 'ESPA SPA DAY FOR 2' Inclusive of Full access of the spa thermal facilities, robes, slippers and towels provided for the day, 2 Course Lunch in the Spa Café plus 2 x 25 minute spa treatments per person of your choice. Be sure to watch our catwalk shows as winners will be announced during our catwalks at 1.30pm & 3pm. Whether you are looking for your wedding venue or just for wedding ideas and inspiration, come along to our fantastic Cheshire Wedding Fayre on the 16th September, 12 - 4pm. There will be a free raffle, lots of prizes to be won and special offers, plus a free drink and canapé on arrival! Munros Menswear - stocking all manner of items from suits and shoes to hats and shirts! Munros also offers a popular hire service for weddings! John and Jane Pratt have been in menswear for over 40 years so can cater to your every need. Stocking traditional and modern wear with quality Scottish, Irish and English made products (good for the C02 emissions as well!) suitable for every age. Munro's will be exhibiting at our popular Chester Wedding Fayre at Brook Mollington Banastre Hotel & Spa on Sunday 18th March 2018, 12-4pm and they will be offering a fantastic 10% off, a great deal for the Grooms and Ushers! They have also donated a pair of wedding cufflinks for one lucky Red Event groom, be sure to watch our catwalk shows at 1:30pm & 3pm when the winners of our free prize draw will be announced. Come along and meet the team, soak up the atmosphere of the fayre and get lots of wedding ideas and wedding inspiration for your big day! Wow Boothtube are offering an incredible £100 off their full 3 hour Magic Mirror package - £395 instead of £495 at our Cheshire & Chester Wedding Fayre on Sunday 28th January. Boxes of fancy dress props to make each picture unique! All they require on the day of our Cheshire & Chester Wedding Fayre is a £50 deposit by bank transfer or cheque to secure your date and the promotion. Whether it is guest entertainment like Boothtube that you want to book for your big day or you just want to find out more about what they can offer, come along to our popular Chester & Cheshire Wedding Fayre on 28th January 2018 for this and much more! We will have everything that you need to plan a wedding, all under one roof. Special offers from suppliers and fantastic prizes to be won in our FREE raffle - winners will be announced at our catwalks at 1.30pm and 3pm. Aloe with us is offering an amazing 15% off purchases on the day of the Macdonald Craxton Wood Wedding Fayre and have donated a small pamper of beauty goodies into our on the day free prize draw! Come along to our popular Cheshire Wedding Fayre on Sunday 29th October for this offer and many more! Whether you are looking to get fit and healthy for your big day or you are after wedding ideas and wedding inspiration, come along to our fabulous Red Event Wedding Fayre on Sunday 29th October, 12 - 4pm. You will be greeted with a complimentary drink and canapés on arrival, all you need to plan a wedding under one roof and free entry in to our raffle with winners announced during our catwalks at 1:30pm & 3pm! You can find out more about Aloe With UsWe look forward to welcoming you! Wow Boothtube are offering an incredible £100 off their full 3 hour Magic Mirror package - £395 instead of £495 at our Cheshire & Chester Wedding Fayre on Sunday 29th October. Whether it is guest entertainment like Boothtube that you want to book for your big day or you just want to find out more about what they can offer, come along to our popular Chester & Cheshire Wedding Fayre on 29th October 2017 for this and much more! We will have everything that you need to plan a wedding, all under one roof. Special offers from suppliers and fantastic prizes to be won in our FREE raffle - winners will be announced at our catwalks at 1.30pm and 3pm. Jeanette Roberts is a Civil Celebrant and she is offering an amazing 10% off all ceremonies booked at our Red Event Cheshire & Chester Wedding Fayre on the 29th October 2017. Come along to our popular wedding fayre and view Jeanette's services in 'The Craxton Suite' at 12:30pm & 2:15pm where she will be hosting our Mock Civil Ceremony, giving you a taster of what you can have on your own wedding day! Jeanette Roberts is a Civil Celebrant who can give you choice with your ceremony. It will be personally written, bespoke and unique. Whether you are looking for a Civil Celebrant or just looking for Wedding Inspiration or Wedding Ideas, come along to our popular Cheshire & Chester Wedding Fayre this Sunday 29th October 2017 at The Macdonald Craxton Wood Hotel & Spa, Chester 12 - 4pm. Come along to our Cheshire & Chester Wedding Fair at The Macdonald Craxton Wood on Sunday 29th October (12-4) to meet the staff at Cherish the Bride and start planning the most important purchase of your wedding day! During our Cheshire & Chester Wedding Fair, Cherish the Bride will be offering a massive 10% off your purchase when an appointment is booked on the day! Cherish The Bride have over 30 years experience in the bridal industry and the team offer a professional, yet personal service to each bride. Whatever your requirements Cherish The Bride can offer an extensive range of exquisite gowns from the traditional, more individual or simply stunning. They can also complete your look with the sparkling tiaras or veils that they have in store. Join us on the day of our North West Wedding Fair to receive the special offer of 10% off your order and you will also be in with a chance of winning a Mr & Mrs frame, donated by Cherish The Bride in our raffle! Whether you still have your wedding dress to find or it is wedding inspiration or wedding ideas you are after, come along to our Cheshire & Chester Wedding Fayre on 29th October 2017 12-4pm. RoseVert Stationery are offering an ‘on the day’ 10% off all stationery orders when booked at The Holiday Inn Ellesmere Port / Cheshire Oaks Wedding Fayre on Sunday 8th October, 12 - 4pm. With a pride and a passion for every design. RoseVert is committed to providing beautiful, bespoke invitations and stationery to compliment your wedding theme! If you are looking for your Wedding Stationary or you are just looking for more Wedding Inspiration or Wedding Ideas, come along to our popular North West Wedding Fayre, this Sunday 12-4pm at the stunning Holiday Inn Ellesmere Port! Robbie Danson: "I mainly perform close up magic which involves interacting with your guests, either whilst seated or standing in groups with things such as cards, pens, coins and other objects. I tend to perform my magic with a certain comedy feel which helps to put the audience at ease and also generate some laughs along the way, ensuring everyone is having a good time - a memorable time." Come along to our popular North West Wedding Fayre on Sunday 8th October 12-4pm, if you book Robbie Danson on the day he is offering a magical 10% off! Whether you are looking for more Wedding Ideas or Wedding Inspiration, come along to our fantastic North West Wedding Fayre at the Holiday Inn Ellesmere Port/Cheshire Oaks, Sunday 8th October 12-4pm for amazing deals, lots of suppliers and a chance of winning lots of fantastic prizes! Wow! Boothtube are offering an incredible £100 off their full 3 hour Magic Mirror package - £395 instead of £495. All they require on the day of our North West Wedding Fayre is a £50 deposit by bank transfer or cheque to secure your date and the promotion. Whether it is guest entertainment like Boothtube that you want to book for your big day or you just want to find out more about what they can offer, come along to our popular North West Wedding Fayre on 8th October, 12 - 4pm for this and much more! We will have everything that you need to plan a wedding, all under one roof. Special offers from suppliers and fantastic prizes to be won in our FREE raffle - winners will be announced at our catwalks at 1.30pm and 3pm.